If you’ve managed not to have heard of Miss Peregrine’s Home for Peculiar Children – congratulations! I don’t know where you’ve been hiding out recently, but with the release of its sequel (Hollow City) last year, I feel like it’s been impossible not to log into Goodreads or Bloglovin’ or Youtube without hearing someone gushing over this incredibly unique, scary, young adult horror book. With all the rave reviews, it’s hard not to go into a book with the highest of high expectations. And just as could be guessed, none of mine were met. The cover alone helped add to the thought that this was going to be a horror novel (c’mon, just look at it!) and I was fully expecting some haunted-house stuff, and something that would warrant all the people that said this was a perfectly creepy halloween read. Instead, I got a story about an annoying young boy who has the ability to travel through time and meets a cast of children who all have some type of special power? Definitely not what I signed up for, and because of that my reading experience was already tainted. Miss Peregrine’s Home for Peculiar Children is a story about a young boy Jacob, who grew up listening to his grandfathers fantastical tales. Stories about a house filled with peculiar children – children with special powers. Some children could turn invisible, while other’s could levitate. And his grandfather had images to back up every story he told. Over time, he managed to convince Jacob that he too grew up in this house. Over time, Jacobs parents and psychologist try to convince him that it’s all in his imagination and it’s impossible that his grandfather could have lived this double life. But one night Jacob witnesses his grandfather being murdered by a monster, and suddenly every tale must be real. So Jacob and his family travel to the island where this house supposedly is. 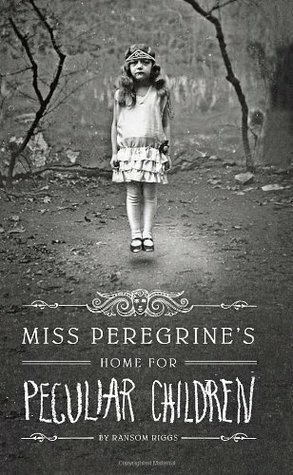 And when Jacob finds Miss Peregrine and her home for peculiar children, everything changes forever. Because not only was his grandfather peculiar, but so is he. There isn’t much more I can say about this series, other than it was downright weird and not scary at all. I found myself skim reading multiple chapters and not forming a connection with any of the characters. I found Jacob whiny, spoiled and dim to me for the better half of the book and never seemed to improve. The peculiars weren’t any better. They are 80 year olds who have been living the same day on cycle for their entire life, trapped in a teenagers body? The fact that this doesn’t have a major impact on their mental stability really bothers me, as I can’t understand how they are still so sane. Jacob also falls in love with a girl named Emma, who used to be in love with his grandfather. If that isn’t weird enough, she is also the age of his grandfather and just happens to still look like a teenager. It isn’t even the age difference that bothers me (how often does a girl fall in love with an immortal boy in YA fiction) but the fact that she used to kiss his grandfather? Jacob, please. The only part of this book I truly appreciated was the photographs Riggs places throughout the book. The reason I say places instead of incorporates however, is because I was expecting the photographs to play a major role in this novel. Instead, the book would have read exactly the same without them. This was quite disappointing, but nevertheless I did enjoy having a visual aspect to help motivate me to continue. Despite a premise that sounded promising and gushing reviews all over the internet, this one just couldn’t keep my interest, certainly enough not to continue the series. Good idea, bad execution. Sorry.